M/Sgt. 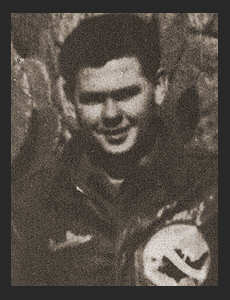 Charles E. Caldwell, Jr. son of Mr. and Mrs. C. E. Caldwell, graduated from Frederick High School. Attented Cameron College. Entered the service in 1941. Trained in Sheppard Field, Texas, Lowry Field, Colo., Brooklyn, N. Y., MacDill Field, Fla. Served in Scotland, England, Algeria, Tunisia, Sardinia, Sicily, Italy, Corsica, France, Belgium, Germany, and Austria. Awarded EAME Ribbon with eight Battle Stars, Pres. Unit Citation with three Oak Leaf Clusters, Croix de Guerre.